A stunning art nouveau inspired ring commissioned with us for a Christmas proposal. Our customer came to us with a very specific idea for this engagement ring to pop the question to his girlfriend, who was born in Lithuania. It had to be rose gold, or 'Russian gold' as it is called in Lithuania, with Rubies incorporated into the design. As his fiancé believed second hand metal can carry 'memories' of the previous wearer the ring had to be new metal, but involve the use of the customer’s old mine cut diamonds. A perfect balance of modern and antique. Tim met with our customer in the shop and was able to draw out some initial ideas and sketches there and then. This helped to ensure we were on the right track and meeting each of the customers requirements with input from both the designer and customer added throughout. Once the design had been decided the stones were unset from the antique ring allowing an assessment as to which stones would work best in the design. As you can see from the photograph the old cuts were varying sizes and shapes so choosing three that would work together within the design was important. Computer Aided Design software allows us to build the ring around already existing stones. In this case it also allowed us to ‘trial’ various combinations of the old cut stones before making the physical ring, therefore choosing the three stones that worked the best together. Once unset we were better able to see the sizes and shapes of the old cut stones. This meant we could accurately build the CAD image to fit. The CAD of the ring was split into three separate sections for casting. This ensured a pristine clean up and the Goldsmith was able to get into each area of the intricate design. Although it could be cast as one piece we wanted to ensure a perfect finish and higher level of clean up. 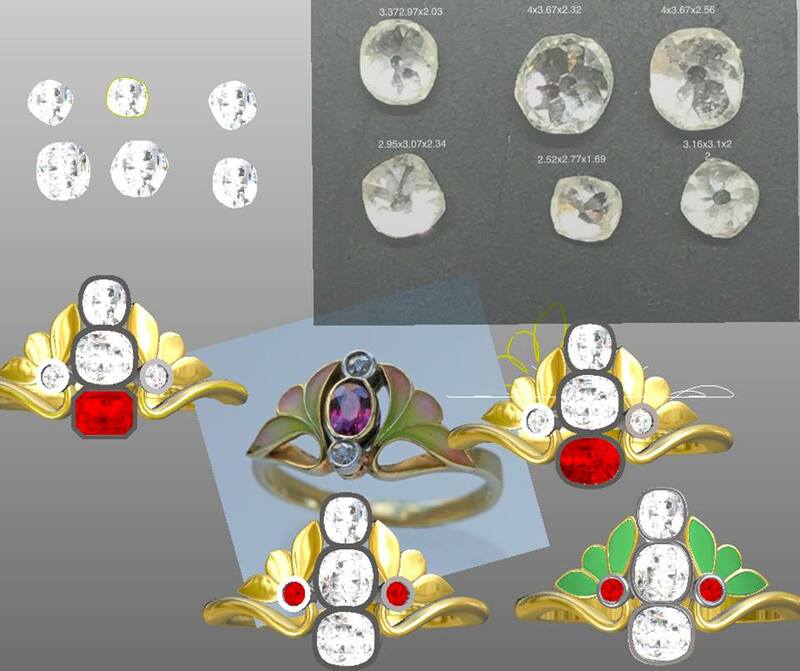 A screenshot from the cad program showing the various diamonds and options with various uses of ruby which had to be included in the design. Old cut diamonds take much longer for our stone setters to make safe and to look as even as possible. above you can see the hallmark of the ring, along with our chichester cross mark. From clean up the ring was sent for Hallmarking at the London Assay office. This is a legal requirement of any piece made in the UK. The mark includes the metal purity, makers mark and for our bespoke items the Chichester Cross mark which is bespoke to us. Once the item returns from hallmarking ti is assembled ready for setting. Our stone setters produce some of the most intricate work in the industry using microscopic lenses to ensure a perfect setting. Being able to re-set old cut stones means we have no limitations on the bespoke work that we can carry out here in our workshops. Post setting our goldsmith and Tim worked closely on the enamelling ensuring that the colour gradient was spot on. The skillset of our goldsmiths is second to none with their knowledge, expertise and patience they create some of the most beautiful fine jewellery. 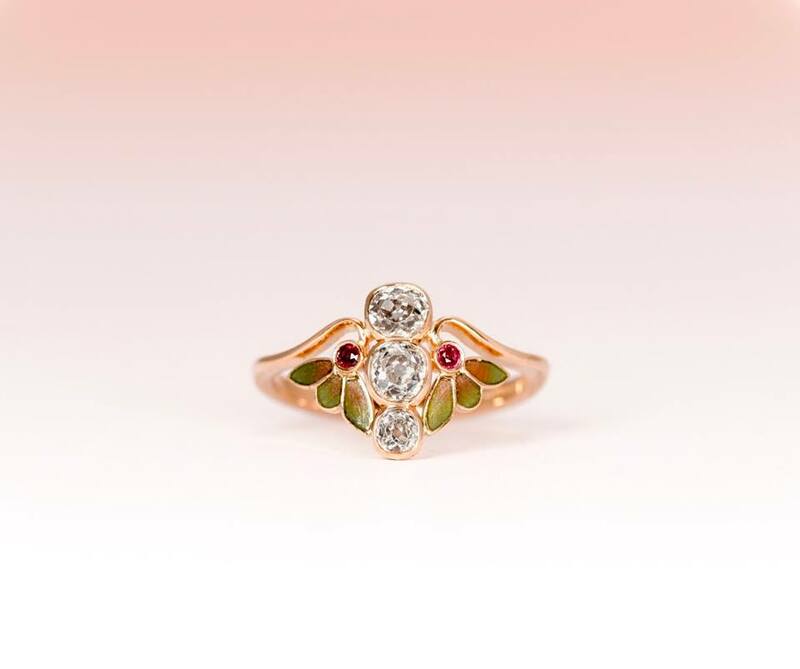 The finished ring was a breathtaking success, capturing an Art Nouveau style using the customers antique diamonds, new rose gold and skilful hand enamelling.